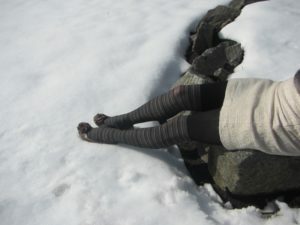 Here are my legs in Lucine tights by Fiore, 40 den. I love this bold flower pattern on the side, very feminine and elegant. These are sheer to waist with a t-top. Just like majority of all other European tights, they feel wonderful on the leg. Superb elasticity prevents it from sagging. These tights are currently on sale for $4.99, it was a limited edition and there are just a few pieces left. Here are some more photos of me from the day when I took some photos outside with my cousin. I am wearing Mirona by Fiore, 40 den tights. They have a sheer band on the thigh. I didn’t actually expect that, on the cover photo it looks like the sock part is thicker and the top part is sheer, but in reality it turned out to be only a sheer band. I think it looks kind of cool, like a peek-a-boo effect. If you like it, have a look here – Mirona by Fiore. 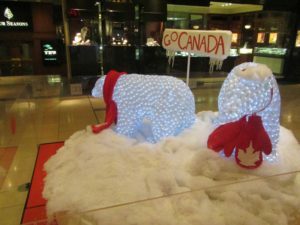 This blog is supported by the shop section. I would also like to thank Marty for buying me this dress. It is really cool for photoshoots! What a wonderful gift. This is my friend showing off her shapely legs in these 40 den semi-opaque Coria tights. I have some in stock and decided to put them on sale for $5.99 for this week only. This is a good beginner style for those who feel that they always rip sheer tights, but don’t want to wear opaques. My friend’s legs in pantyhose with floral print in Calgary. I took this selfie photo still in spring, but didn’t get to upload it anywhere up to now. The weather got cold again here, so I am back to wearing 40 den. A good friend of mine bought these tights from me for some other girl and she ended up getting the size wrong. That girl ended up being very skinny, but extremely tall, so medium didn’t fit. As soon as I heard of it, I gave them a full refund and took these pantyhose for myself. Now I get to enjoy these textured tights in my own pantyhose drawer. In case you like it, I’ve got some new pairs in stock in black and in mocca. It’s actually on sale now since this was a limited edition a few years back. 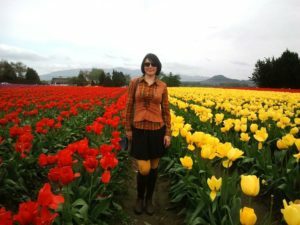 I gave Natasha a pair of 40 den Cecilia de Rafael tights in mustard colour and asked her if she can match it to some of her clothing. 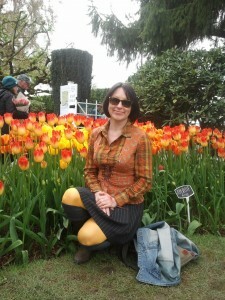 Natasha sent in these photos to show how she wore it to the tulip festival near Seattle. Mustard is a very hard colour to work with, but Natasha has a certain skill in combining colours. It is so rare to have snow here! We had some a few days ago and I decided to take some photos posing in it before it melts. I almost lost a shoe in the process. In case you are wondering, I am wearing Nessa pantyhose by Fiore. They have some of white undertone to them to create the pattern, hence the top is not pitch black but more charcoal. I’ve been chatting with LuvFemToes on twitter – they are a unique sites for people who like feet and post high quality studio photographs. Here are some photos that they did of Fabiana style by Fiore. I have some of those in the shop section, but I never actually wore this style myself. This makes me want to try it out! I love that ivy pattern on the side. These are 40 den, microfiber. Enjoy! This is me and my relative posing in sparkly pantyhose for the holiday season. She came over for a visit a few months ago and I asked her to take some photos with me with the upcoming holidays in mind. My pantyhose has metallic fibre pattern on it and her pantyhose has diamond look crystals attached to it. Both are 40 den, seasonal collection by Fiore. To make us matching, we both wore black suede shoes. Felt good to celebrate in Lurex! I just can’t do it on New Year’s without a beautiful pair of pantyhose.